With Cubs on national TV tonight prior to hosting the Phillies this week I felt it was a good time to honor Hall of Famer Ron Santo. 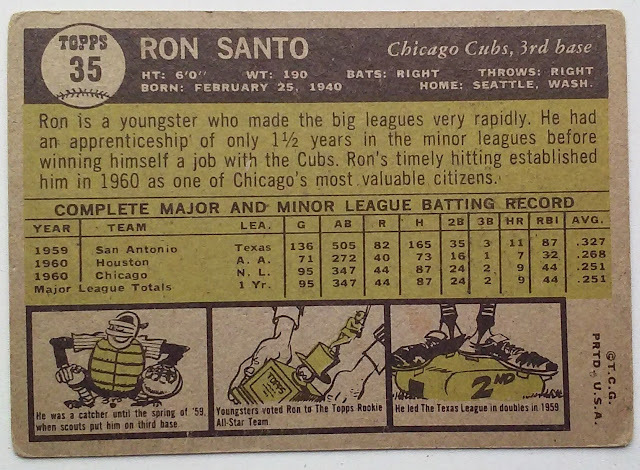 Due to Topps diligence (and traded sets) it is rare that a player of Santo's stature gets a Rookie Cup on his actual rookie card. I took a glance at the list and among Hall of Famers the only other rookie cup/ rookie card combos I found were Willie McCovey (1960) and Eddie Murray (1978). There are three other players that qualify, however they won their Rookie All-Star awards in years when Topps chose not to adorn winners cards with the rookie cup icon: Ozzie Smith(1979), Ryne Sandberg(1983), and Kirby Puckett (1985). 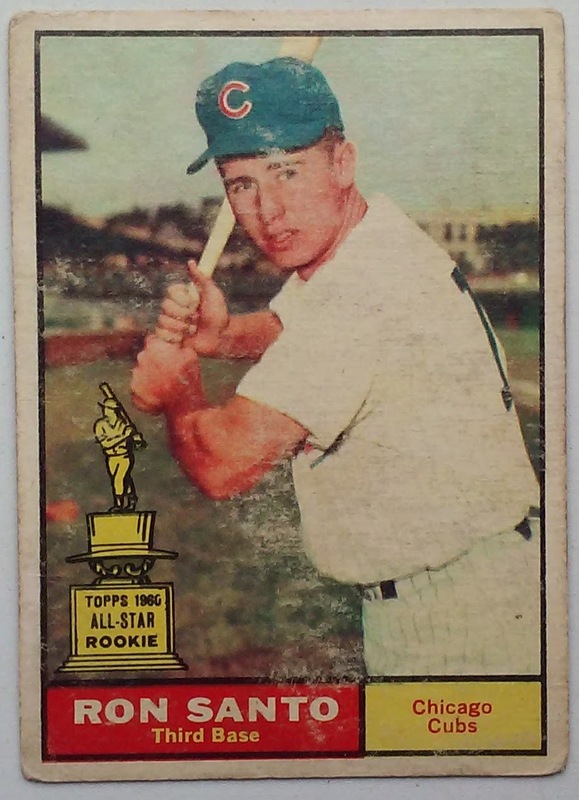 In a 1961 interview in "The Sporting News" Topps executive Sy Berger addressed the omission of both Willie McCovey and Ron Santo from the 1959 and 1960 sets respectively. Regardless both were properly honored with Rookie All-Star cards that also happen to be Hall of Fame Rookie Cards. The center panel of the cartoons mentions Santo's Topps All-Star rookie award. Of the 10 All-Star Rookie cards in the 1961 Topps Set, seven of them have cartoons mentioning their selection. The text notes that there was a Vote by "Youngsters". As part of an outreach program to raise interest in trading cards Topps sent out ballots via various youth organizations including the Boy Scouts, Boys Clubs of America and the YMCA. The Results of the voting were the early All-Star Rookie teams. The origins of the Topps Rookie All-Stars is worthy of it's own posting and we hope to elaborate on this at some point. April 18th marks the 30th Anniversary of the day Mike Schmidt joined the 500 Home Run Club. Not only was the Home Run a milestone number, it was also a high impact HR. Entering the 9th inning versus Pittsburgh on the road the Phillies trailed 6-5. Schmidt was scheduled to hit 5th that inning. Fortunately for the Phillies Milt Thompson singled and Von Hayes walked which allowed Mike Schmidt to come to the plate with two outs in the 9th. It was then that Schmidt hit is 500th career Home Run. The Home Run came off of Pirates Pitcher Don Robinson. Former Pirate Kent Tekulve came in for the save and the Phillies went home with a 6-5 victory. For video of the HR click here. In 2005 Upper Deck honored the event with a card in their Classic Moments Insert. Nice looking card with the 70s era Phillies Logo I remember from my childhood. The photo does hit one of those minor things that drives me crazy. 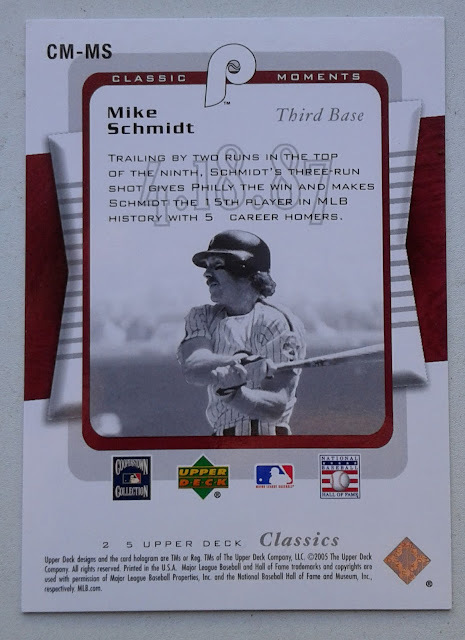 This game-dated card notes an event that happened in Pittsburgh, however Schmidt is clearly wearing the Phillies Home uniform. The Classic Moments set consisted of 20 cards three of which are dedicated to Phillies. The two other Philadelphia Reps are Lenny Dykstra and Steve Carlton. 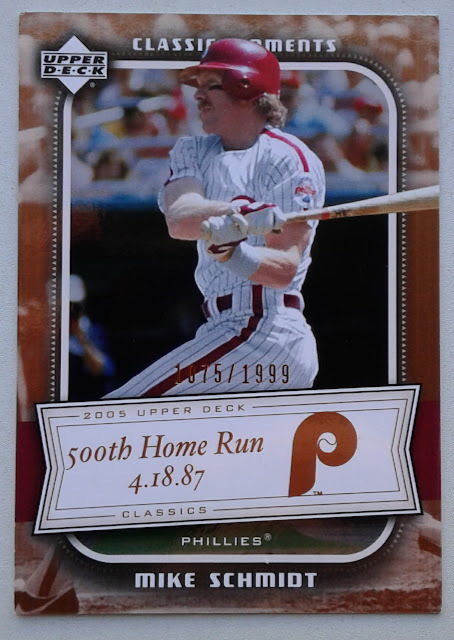 The base set for 2005 UD Classics is also noteworthy for having a Ryne Sandberg Phillies Card. The blurb on the reverse gives a mini summary of the Home Run with the date of the game nicely ghosted behind the text. After hitting the Home Run Mike Schmidt returned to the field as a SHORTSTOP. Due to a series of late game moves by Manager John Felske both Luis Aquayo and Steve Jeltz were out of the game for the Phillies. Schmidt filled the vacancy and Rick Schu came into play 3rd Base. Neither player fielde a chance in the 9th inning as Tekulve induced three fly outs. Little bit early on this Anniversary posting but we have a Phillies card to get to as well. 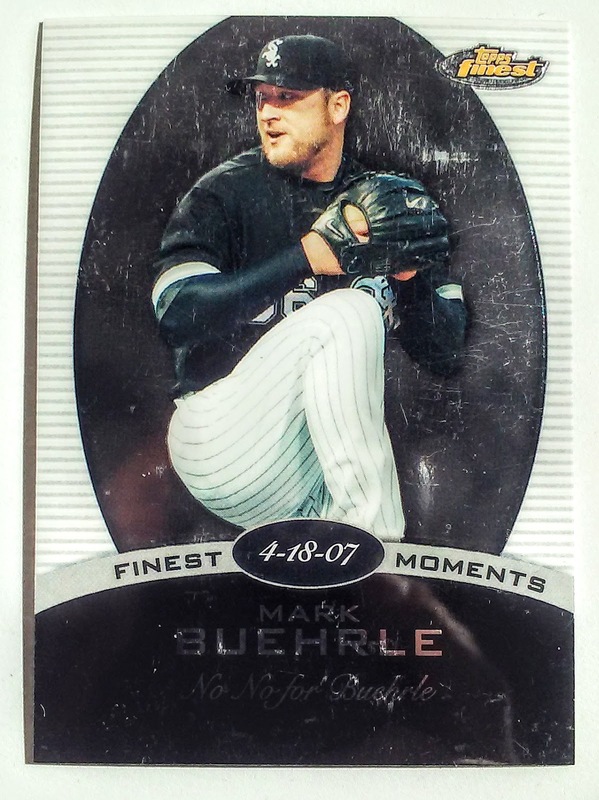 On April 18 2007 Mark Buehrle posted his first of his two career No-Hitters. The victims of the Chicago White Sox 6-0 victory were the Texas Rangers. Batters in the Rangers potent lineup that day included Past & future Phillies Kenny Lofton and Michael Young as well as several other luminaries: Ian Kinsler, Sammy Sosa, Mark Teixeira and Nelson Cruz (Who batted 8th!). Jeraine Dye provided the bulk of the offense for the White Sox with a grand slam off of Phillies Alum, Kevin Millwood. Jim Thome picked up the other 2 RBI on a pair of Home Runs one off of Millwood the other off of current Phillies reliever Joaquin Benoit. The back of the card does a good job of succinctly summarizing Buehrle's big day. His other no-hitter versus the Tampa Bay Rays in 2009 was a perfect game, therefore he pitched to the minimum at least twice. 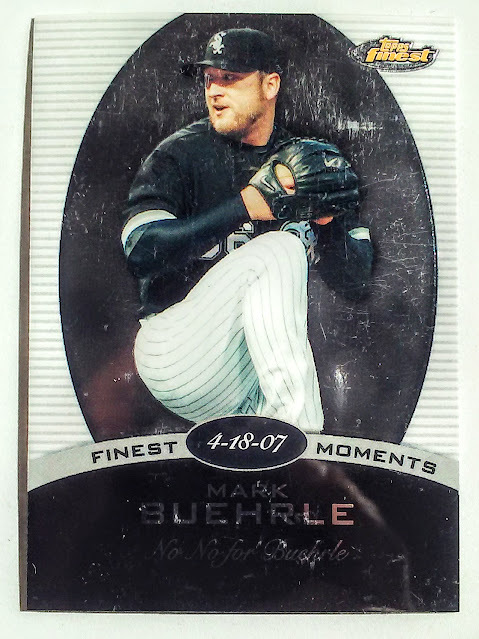 Buehrle's battery-mate for the no-hitter was AJ Pierzynski. 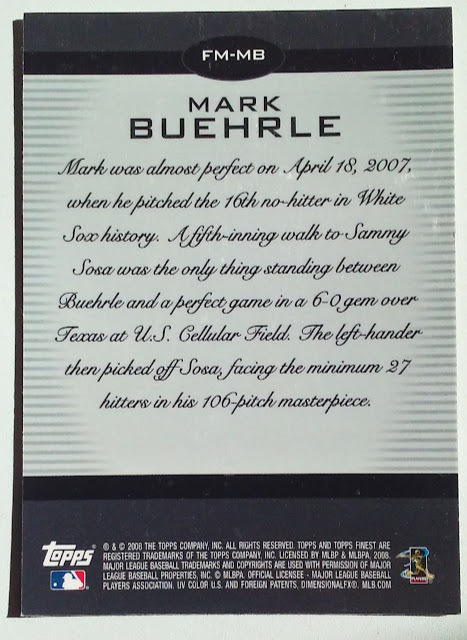 AJ did not call Buehrle's perfect game but he was the backstop for a different White Sox perfecto authored by Phil Humber. The plate umpire for both of the no-hitters was Eric Cooper.